HISTORY: TRANSADRIATICA: Anonymous Air Navigation Company (also known as Transadria) founded in Ancona in August 1925, headquartered in Venice the following year, at the initiative of Junkers GmbH, is among the first airlines Italian for the carriage of passengers. It started operations in 1926 with the connection between Rome and Venice and a connection to small Junkers single-engine for four Venice-Klagenfurt-Vienna passengers, in collaboration with Austrian OLAG. The regular service was inaugurated on February 1, 1927 and the following April 19 was extended, three times, to Vienna, with Junkers G 24ge trimmers. An intermediate stop was sometimes carried out in Foligno. Another route between Brindisi and Munich was introduced in 1928 and in 1931 the service was established from Rome to Munich in collaboration with DLH (Deutsche Luft Hansa). 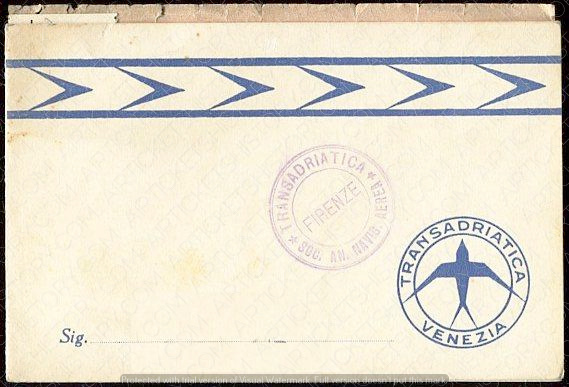 In December 1931 Transadriatica merged with the Mediterranean Air Company (SAM).